For years, the hashtag (#) has been a staple of Twitter, allowing users to view, organize and engage in conversations related to specific topics and events. Today, Twitter remains king of the pound symbol, but along the way other social websites have followed suit, including Google+, Pinterest, Tumblr and Instagram. And now, after what seems like years of resistance, Facebook has finally jumped on the bandwagon and is now supporting hashtags. 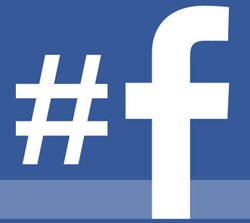 So why has Facebook now decided to embrace the hashtag? Well, there are probably a few reasons. One is that the hashtag gives Twitter a big advantage over Facebook from a user perspective. Twitter’s much more open than Facebook, and hashtags are a catalyst to participate in real-time conversations of interest and discover new people to connect with. So basically, one could argue that Twitter is truly more social than Facebook, and the hashtag is a big driving force behind this. Another reason Facebook is now adopting hashtags is that it also gives Twitter and other social websites a big advantage from an advertising standpoint. After all, they gotta bring home the bacon, right? Hashtags not only allow users to organize and engage in conversations, they allow businesses and marketers to do the same. Hashtags are also keywords that advertisers can bid on in order to get in front of their target audience. So now, by adopting hashtags, more than likely Facebook will soon give advertisers a new tool to make their ads more targeted and relevant. How Can Hashtags Work for My Business? If you’re an online retailer with a Facebook presence, there are a couple of ways you’ll be able to use hashtags once they’re completely rolled out to all users. One way is to simply include relevant tags in your Facebook posts on your business page. Here’s an example…. 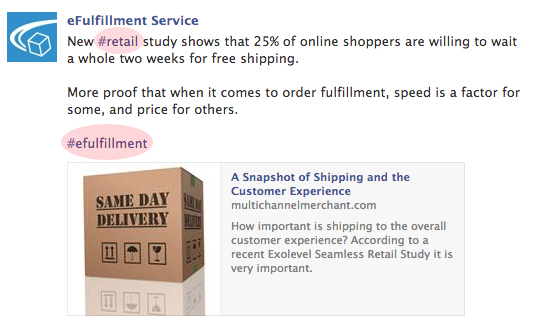 In the Facebook post above, a hashtag was added in front of “retail,” a word that was simply part of the sentence. At the bottom, in a slightly different approach, a hashtag was put in front of “efulfillment,” which was not part of the sentence. So this example outlines a couple of ways of incorporating hashtags into your content strategy. One is to add them to words that are part of your actual posts, and in such cases, marketers should think about optimizing posts so they’re using keywords that are trending and/or relevant to their businesses. The other way to incorporate hashtags is to tack them on to the end of your posts. In the example post above, the subject matter was relevant to online order fulfillment, also known as efulfillment. While efulfillment was not worked into the actual sentence, by adding it to the end, it still provides a way for marketers to tag posts for greater relevance and discoverability. There’s little doubt that marketers will soon be able to use hashtags as a means to target Facebook users with their ads. As opposed to using hashtags in your posts, bidding on relevant hashtags as part of an ad campaign will allow your brand and content to maintain contant visibility within hashtag streams. Bidding on hashtags is similar to bidding on keywords with a pay-per-click campaign in search engines. However, marketers should keep in mind the intent of users on Facebook. While the goal is always a return on investment, with social advertising, marketers should view it as a brand building effort to a large extent, and accept the fact that social users may not be ready to buy at that particular moment…..so adjust conversion points and goals accordingly. Just like with Twitter, hashtags on Facebook are clickable when on a desktop computer (with mobile likely on the way). When clicked, users are taken to a stream of content with posts from all users on that particular topic. Links, however, are not the only way to discover hashtag content. The more obvious way is through search. Back in January, Facebook announced Graph Search, which is still in beta and not yet rolled out to the general public. Graph Search isn’t web search, but rather a way for Facebook users to find other people, places, interests and photos….all on Facebook. For example, using Graph Search, I could do a search to find Chinese restaurants nearby that are liked by my friends. Kinda cool, right? And you can see the potential. Hashtags aren’t yet a part of Graph Search, but my prediction is that they soon will be. 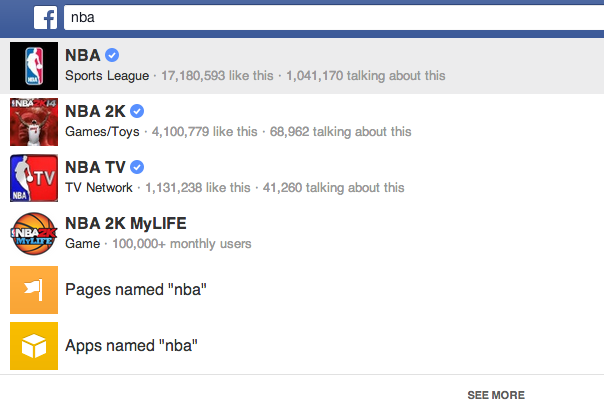 For example, when I type “nba” into Graph Search, here’s what Facebook serves up…. You can see on the bottom that Facebook provides an option to click on pages and apps named “nba.” My guess is that soon hashtags will be a part of those suggestions. After all, if Facebook’s going to make money from advertisers bidding on hashtags, might as well try to increase their impressions. Hashtags have long been at the root of what makes Twitter so popular, and they’re now an integral part of the biggest social network in the world. Take advantage.